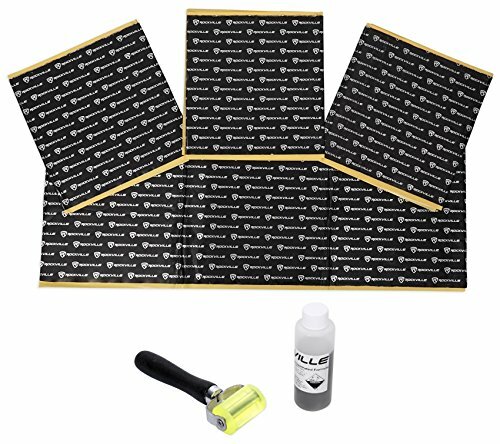 The Rockville Rockmat RM12-B sound dampening material is a must have for any professional car audio install. This package includes 4 sheets that are each 3 square feet. This gives you a total of 12 square feet. This is perfect to be used as a door kit to cover all 4 of your doors. We also include everything needed for a quick and easy installation! Our Rockmat will increase how loud your car stereo plays! It also improves bass quality and eliminates those bad rattling and distortion sounds. Installing Rockmat improves bass quality of the speaker and eliminates those bad rattling and distortion sounds. Our Rockmat is built to the highest standards in this industry using 100% butyl rubber with a layer of heat resistant aluminum. Butyl rubber is the same material high end speakers surround material is made out of. We use the highest quality pressure-sensitive self-adhesive to make your installation quick and easy. Our model has increased flexibility for an easier and more permanent installation! Our sound dampening product uses 72mil of pure grade aluminum! Most products on the market use 50mil. Our product will absorb sound better than the competition. The other products on the market like most of the GTMAT series for example use a mixture of asphalt in their products. They basically are manufacturing roofing material and calling it sound deadener. Their product will work OK, but not nearly as good as our Rockmat. Our Rockmat is made of 100% butyl rubber and an aluminum heat resistant shield which is the same as many of the more expensive brands out there that sell for twice our price.. We only make top quality gear over here at Rockville! These are comparable to the ONYX series by GTMat. (Only we sell it for the price of their lower series! ).